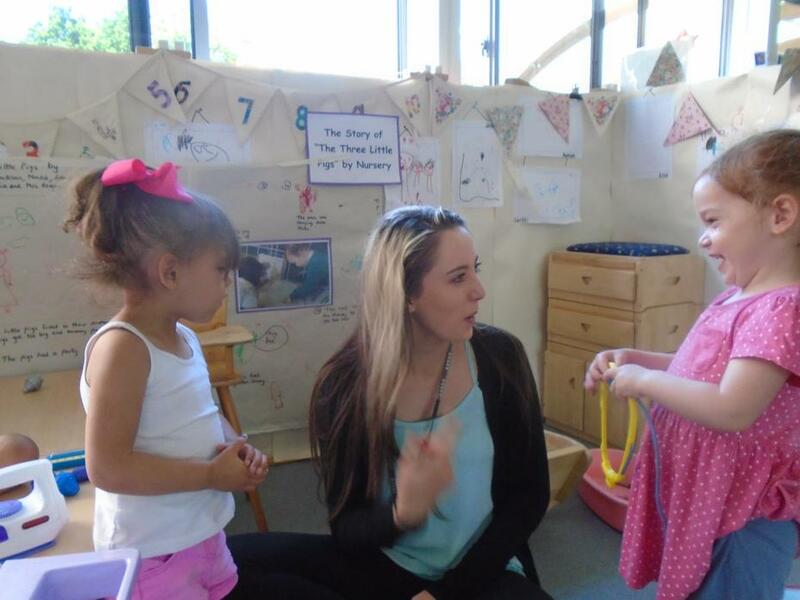 In Nursery, during “Discovery Time” staff will take time to observe children to see what has taken their interest – this will be what they want to talk about. They will make sure they are face to face with the child, so that the child can see they are talking to them. This often means they will sit on the floor and play with the child. This will let the child know they are attending and listening to them and will develop early imitation and turn taking skills. They will name objects of interest and describe the actions that the child makes. This will help the child link a word with an object or action. They will repeat a word several times within the one play session. Typically developing children need to hear a word over 35 times before they learn it and for children with speech and language difficulties this will be much more. They will use short, clear sentences. They will make key words stand out for the child by showing them what they are talking about by touching the objects they are playing with. They will use Makaton gestures, facial expressions and stress in their voice to keep the child’s interest. They will comment on what they see, avoiding asking too many questions. Children do not learn to speak by being questioned. They will say what the child might be trying to say by interpreting their play. Children learn to talk through imitation of what others say. They will model correct speech sounds and new words to children. They will expand the child’s utterances by adding another word to what they have said. These techniques make talking easier for children in Nursery.